The ABC's (Australia Broadcasting Corp.)secret is about to be let out. Deep within the bowels of its Elsternwick offices sits a self-effacing animator with white Colonel Sanders-style facial growth who creates magical puppets. Each bug-eyed creature is carefully handmade, painted and primed before making its star appearance in Nick Hilligoss' short films. Animation is incredibly labour intensive, but Hilligoss takes it to another level. Not only does he make several versions of each puppet for different shots, he meticulously builds and paints the life-like three-dimensional sets. Only then does he start filming. It is why Hilligoss who is attached to the ABC's natural history unit, often vanishes --- into his cluttered office version of the backyard shed - for long stretches of time. "He disappears for a couple of years at a time and the whole ABC hierarchy changes around him, but I don't talk about him because people might find out he's there", laughs, Dione Gilmour, the head of the ABC's natural history unit. Gilmour lured Hilligoss, then a modeller at the ABC, to the unit after she spotted his miniatures of extinct animals for the Nature of Australia series in 1998. "We dragged Nick in here because I could see that there were signs of brilliance about the guy", she says. Hilligoss' knowledge of dinosaurs, honed as a kid matches that of any dinosaur expert in Australia, she says. So his first job was to make animated versions of dinosaurs and other extinct animals - the only creatures the unit's wildlife cameramen couldn't capture on film - for documentary, Once Upon Australia. "Unfortunately for me, when I was halfway through doing it Jurassic Park came out and overnight it was obsolete, so I tended to go a little more towards the humorous approach because I wasn't really going to impress people with how amazingly real these dinosaurs were", Hilligoss says. The show which took two and a half years to complete, won a number of international animation awards. "After that I wanted to do something shorter more manageable, and I ended up doing five shorts called Bunch of Fives in the same time", he says. His latest labour of love is the five-part animated series Good Riddance, which chronicles the exploits of an eco-friendly pest controller and his uninvited house guests, a streetwise gang of rats. "A five-minute film is about six months of work", Hilligoss says. "That's if all goes well, but if there is difficulty, delays creep in". The main character - a laid back pest controller with fluorescent orange mohawk and army green shirt - was loosely based on Peter. A possum catcher called in by the ABC to deal with some stray pigeons. "He was the inspiration for the possum film (Bunch of Fives) but it also got me thinkng about pest control. I started thinking of different pests and what might be used to get rid of them". Hilligoss' cavernous studio is neatly stacked with up-ended paint brushes, piles of puppets. Cute latex rats and various odds and ends that can, and probably will, make their way into one of his films. In here, he has spent eight years bringing foam latex to life using stop-motion animation. 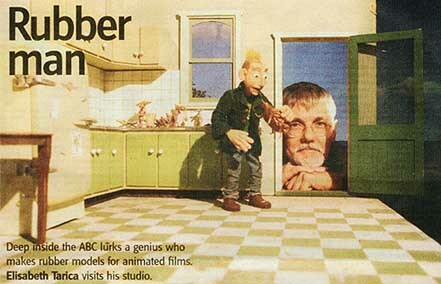 The technique, made famous by the Aardman characters Wallace and Gromit, involves shooting models one frame at a time moving them slightly each time. It is a excruciatingly slow process that demands nerves of steel. Hilligoss says stop-motion animation has surged in popularity because digital filmmaking techniques have made the process easier. Furry little puppets can move like they've never moved before thanks to digital post-production. Now, instead of hiding puppet props from the camera, rods and fishing line can be digitally erased after a sequence has been filmed. Gilmour says Hilligoss' films are full of humour and heart and appeal to a wide demographic. "He can sum up really complex arguments about the environment in five minutes in such a way that nobody feels that they are being preached at ", she says. "This whole series (Good Riddance) is about a biological pest controller, but most of his solutions don't work the first time so he's not saying biological pest control is the panacea for all problems, he's saying there's a heck of a lot of trial and error. "You can appreciate it for the characters and the amusement, but if you look at it any deeper there's many layers of meaning underneath all that".